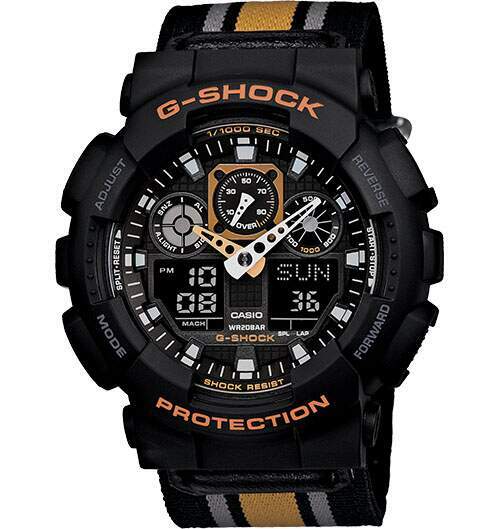 G-SHOCK has again combined rugged functionality and tough style with the latest addition to its ever-expanding range of technically fashionable timepieces: the GA100MC Military Cloth. By incorporating the raw durability of military stripped nylon webbing, an additional suggestion of adventure has been added to the iconic GA100 series. All models are magnetic resistant, 200M water resistant, shock resistant, employ a reverse LCD display, and feature , 48-city World Time, 1/1000th Sec. Stopwatch, Countdown timer , Auto LED light and of course, 12/24 hour formats for true military timekeeping. 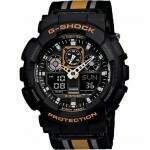 Orange analog and digital watch with a black face.